We are pleased to announce that the AGS Group has signed a formal partnership agreement with the Union of French Expatriates (UFE). We are pleased to announce that the AGS Group has signed a formal partnership agreement with the Union of French Expatriates (UFE). Through our global network we are delighted to already serve French expatriates worldwide, and this partnership brings new opportunities to benefit these clients with customised moving services for their unique needs. 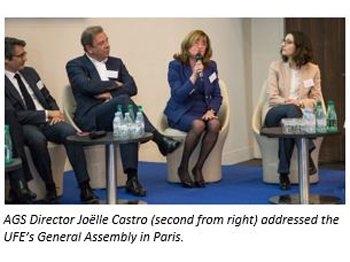 AGS Director Joëlle Castro (second from right) addressed the UFE’s General Assembly in Paris. 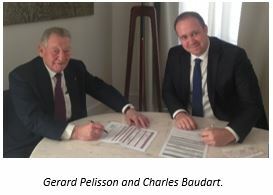 Mr Gérard Pelisson, Chairman of the Accor Group, recently signed an agreement with the AGS Group’s Chairman, Alain Taïeb. This establishes a partnership which sees AGS joining forces with the Union of French Expatriates (UFE) – an organization Mr Pelisson has led since 1997. Founded in 1927, the Union of French Expatriates (UFE) is recognized as a public interest organization. Its network unites French nationals, French speakers and Francophiles worldwide. The UFE’s actions are driven by four strong values: hospitality, mutual aid, friendliness and outreach. The organization works to protect French nationals abroad in the areas of health, education, security, taxation, suffrage and citizenship issues. The UFE is also a representative in the field for the French Embassy, the French Consulate and other authorities in France. Its role as an intermediary with local communities is very important, especially with regards to the security of French citizens. The UFE is present in over 90 countries and the AGS Group is established in 84 countries, so we both have many synergies to develop! Our shared goal is to provide support to French people around the world: whether they are already expatriates, or upon their departure from or return back to France. It is with great pleasure that we are participating in this exclusive partnership project. The agreement was signed on 25 February in the presence of Gerard Pelisson, UFE Chairman; Marc Boudin, UFE General Delegate and Charles Baudart, AGS Movers France President. Gerard Pelisson and Charles Baudart. A delegation of the AGS Group was also honoured to attend the UFE’s General Assembly. This took place in Paris on 12 March, and was followed by an evening gala attended by 330 guests. The event was a valuable opportunity to present AGS’ activities to all UFE directors and partners, and discuss future joint actions at local and international levels. Firstly, this partnership enables the UFE to benefit from our expertise in moving and relocation services; and secondly, reinforces AGS’ presence amongst French nationals and UFE members overseas. Joint actions will also be swiftly initiated through all the means at our shared disposal – including newsletters, articles in the UFE’s ‘La Voix De France’ magazine, and local actions in partnership with UFE branches worldwide. We are thrilled with this agreement and the opportunities that it presents to both parties!